Market research company J.D. Power issued its annual U.S. Paint Satisfaction Study last week, and Benjamin Moore and Sherwin-Williams topped the charts in terms of consumer satisfaction. 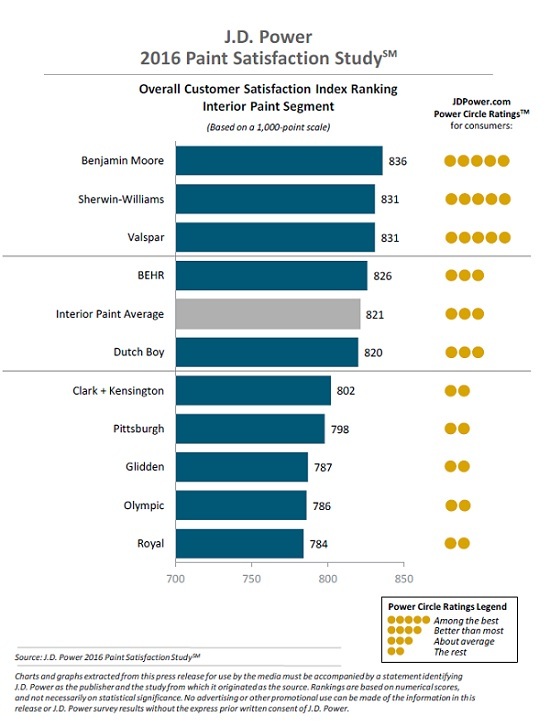 Benjamin Moore got top marks for interior paint satisfaction, with Sherwin-Williams and Valspar tied for second place in that category. 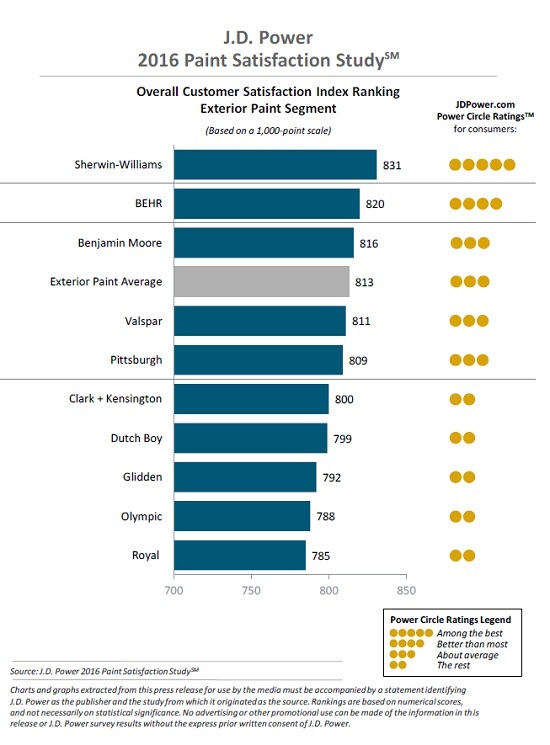 Sherwin-Williams ranked first in terms of exterior paint, with Behr and Benjamin Moore following. J.D. Power surveyed more than 8,600 consumers for its 2016 Paint Satisfaction Survey. The report also gauges satisfaction with exterior stains—Benjamin Moore took the top spot in that category as well, with Sherwin-Williams and Behr just behind. For the survey, J.D. Power elicited responses in early 2016 from more than 8,600 consumers who had bought paints or stains in the past 12 months. Consumers were asked to rate their satisfaction with the paint products they purchased in terms of application, design guides, durability, price, product offerings and warranty/guarantee. According to the report, application, product offerings and durability are the most important factors in customer satisfaction with paint and stain products. J.D. Power's exterior paint satisfaction ratings. It’s a change from last year, when Behr took the top spot in interior paints, and Clark + Kensington was rated highest among exterior paints. The survey also addressed paint retailers. In the retail category, Sherwin-Williams ranked first, with Ace Hardware and Benjamin Moore Independent Retailer in the second and third spots. Sherwin-Williams ranked first in 2015’s survey as well. For the retailer section, consumers were asked to consider merchandise, price, sales and promotions, staff and service, and store facility. According to J.D. 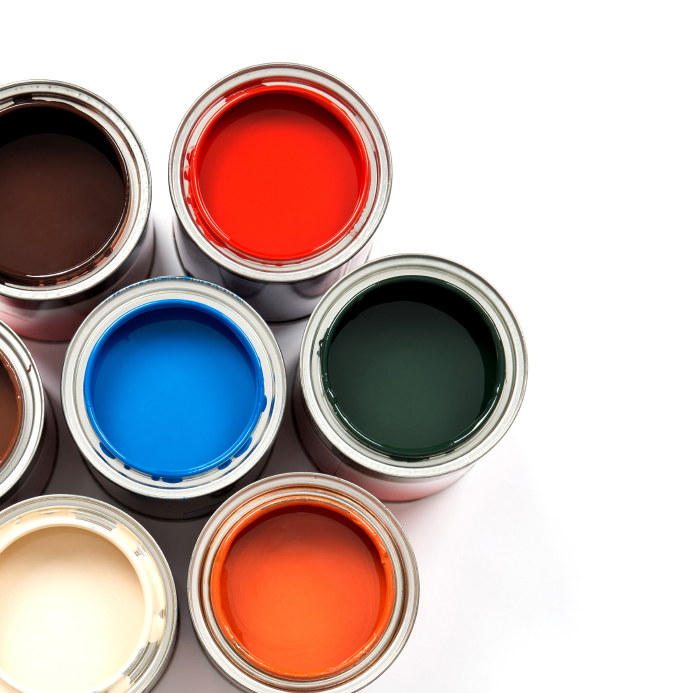 Power, customer satisfaction with paint retailers comes down to two major factors: salespeople who listen to the consumer, and staff who offer help with product selection and tips on application. Those who felt they were helped by store staff said they were more likely to be returning customers, according to the report. “Paint and stain is one of the very few product categories that has not transitioned to an Internet-based sales model, making the retailer and customer-facing store staff a crucial component to the overall customer experience,” said Greg Truex, senior director of J.D. Power’s at-home practice.